Sand Petals is an absolutely AMAZING company. They made our wedding a dream come true and it was perfect!! Their entire staff was absolutely incredible!! They do anything and everything for you to make sure you day is exactly the way you want it and that you have a total enjoyable experience. Josh and I had an absolute ball and our family had a blast too! The day was sooo perfect! They did an AMAZING job on all the decorating, coordinating, food, etc! They were organized, first class, and on top of everything from the time we contacted them and started planning the wedding to the last dance that night. The luau show is absolutely AMAZING!! It is a definite must have and made the night that much more memorable. I would highly recommend this company for all weddings if you’re looking for a beautiful beach wedding and a night to remember! Sand Petal Weddings was awesome. The entire staff and all the vendors were amazing. The wedding was a blast. Everything was perfect. Cathy, Lisa and the girls at Sand Petal Weddings were awesome! We planned from a far, and they worked well with us to coordinate everything and help create a day that we will remember for years to come. They worked through a rain challenge the day of and gave us a beautiful wedding! We wouldn’t change a thing, everything was perfect!! Thank you so much! Sand Petal Weddings were fantastic at planning the wedding and being there for me on our wedding day. We had never been to where we were having the wedding and they planned everything perfect and made sure it was exactly what I had wanted. All of our guests said it was the most amazing wedding they had ever been to. We had the Luau option which was so memorable and fun. If I had any questions they would respond right away and were on top of the catering, photography, videography and the pastor to make sure they all knew exactly what we wanted. 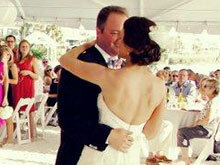 I couldn’t have imagined a better wedding and it was all thanks to the wonderful planning of Sand Petal Weddings. We were going to do a destination wedding and it all fell through, they planned it all within two months and then we got to leave our guests behind in Florida while we went alone to the Bahamas to truly get the best of everything. The SPW staff were amazing throughout our entire planning process! 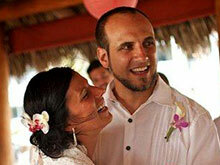 Every detail was taken care of by them, and we did not need to worry about a thing on our wedding day. This really took a lot of the stress out of planning our destination wedding! Our wedding was beautiful and our guests had the best time! Everything from the setup of the ceremony, getting all of the vendors scheduled, making sure the timeline ran smoothly, to the fun luau – we couldn’t have dreamed up a better wedding if we’d tried! We will always cherish this day, and we will especially cherish the fact that we were able to concentrate on our guests and each other while knowing SPW would take care of everything else. They were more than accommodating when we asked to change details a couple of times. They even helped us create a new centerpiece that went with the theme we envisioned. They also helped us get the food we wanted with our smaller guest count, and included an extra dancer for our luau show. Staff from SPW regularly emailed us to make sure all of the details were taken care of throughout the planning process. 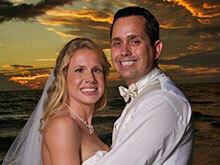 We highly recommend SPW for your gulf coast wedding! Thank you SPW!!! Sand Petal Weddings did a fantastic job on our wedding. I would absolutely recommend this company to anyone! They handled every single aspect of our wedding. It made this a very stress free enjoyable time for us. They took care of every detail. Every question that I had was answered quickly during the planning process. They made lots of suggestions to improve our wedding. Wonderful, Wonderful Job!! 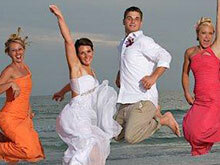 I loved the convenience of having an all inclusive wedding! It was made very simple for me I just had to pick my decor and everything else from the packet sent to me from Sand Petals. I did the Mother of Pearl package. Everything, I mean everything, was included in that package except your attire! It came with a videographer, dj, photographer, delicious food, great location, and a 45 minute luau performance which my guests loved! Staff is wonderful to work with and everything went perfectly. You can tell they’ve done this a time or two. The only thing I can think of to my disliking is that I’m on my 8th week from the wedding and I still have not received any of my pictures from the photographer. I was quoted 4-6 weeks but then again this is the busiest time of the year. Would definitely recommend this company. I have to admit I was very nervous at the beginning when choosing Sand Petal just because I had never met them and I live states away but I couldn’t have chosen a better group of women to help me and my husband on our special day. They were fabulous to work with! We specifically worked with Catherine and Lisa and they were great! 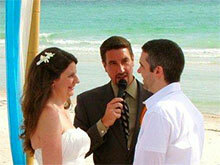 Any questions were always answered promptly and the ceremony and reception were great! 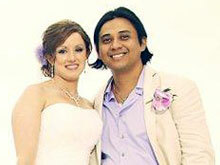 They hired great vendors – our DJ was fabulous as was our pastor Danny and the reception location could not be better! (Haven’t seen pictures yet but photographer seemed professional and very accommodating to requests). Everyone that attended said it was by far the best wedding they ever went to and hope that Dan and I will get remarried each year just so they can attend again! LOL! Overall, if I could give Sand Petal more than 5 stars I would! Such a great and memorable day! I can’t possibly thank them enough. Everyone at Sand Petal Weddings was AMAZING!! I would recommend them over and over again! The set up for my ceremony was beautiful, and far beyond my expectations. The set up for the reception was equally beautiful. Lisa and Cathy helped me every step of the way and went above and beyond to make sure my wedding was everything I had dreamed and more! They have excellent communication through the whole planning process, and helped me to put my wedding together in 6 months! All the vendors they worked with were wonderful as well! I wish I could relive the day all day, everyday! My wedding was perfect! 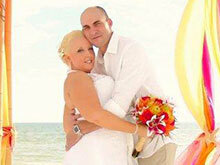 I am so happy that I used Sand Petal Weddings to plan my special day. I’ve always wanted to get married barefoot on the beach, but since I’m from Pittsburgh I wondered how I would be able to coordinate all the vendors without losing my mind. I found Sand Petal Weddings and it was a breeze! 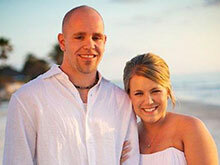 They have been so helpful and friendly throughout the whole wedding planning process. I can honestly say the only thing I stressed about was the weather because I choose to have both the wedding and reception on the beach, but that was perfect too. I loved everything about the day. The set up of the ceremony was beautiful. I am so grateful we had a wonderful pastor for our ceremony. We really enjoyed the shell toss and our sunset pictures. The ceremony was everything I imagined. Our Sand Petal Coordinators set up everything, the champagne flutes, place cards, favors, and made our tented reception on the beach look picture perfect. Our luau show was so much fun and gave us a lot of laughs. We really enjoyed the food and loved the wedding cake. We had 75 guests from Pittsburgh fly to be with us and they all remarked how wonderful the wedding was. They said it was the best wedding they’ve ever been to! Dancing in the sand with my husband, family, and friends was a dream come true. 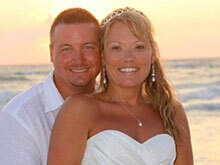 If you want a beautiful, fun, non-stressful wedding on the beach, Sand Petal Weddings will make it happen! It was the best day of our lives! Thank you Lisa, Cathy and staff!!!! Sand petals made our day amazing!!! The decorations, food, dj and photographer were fabulous. 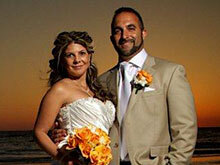 They were very professional and always responded to my emails within hours and made the whole process stress free!!! We could not have been more happy with sand petals!! I would highly recommend them. we can’t say thank you enough!! Amazing! I didn’t have to stress about one single thing. Everything was exactly what was discussed. We sincerely thank SPW for making our wedding dreams come true! 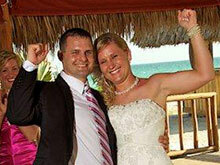 We are were so grateful for their expert orchestration of our wedding day…even hurricane winds didn’t stop them from creating a perfect tented beach reception on Siesta Key! We consider ourselves blessed to have had the privilege of working with a team who truly cared about every last detail. EVERY detail exceeded our expectations and we know our guests were so impressed/having the time of their life! Thanks again Sand Petals team! Each of you were professional, yet personable when promptly answering our questions, ensuring the tables were set perfectly or even nicely asking “wedding crashers” to leave. Thank you again for translating our vision with such style and grace. Sand Petal is the best. I don’t have words to describe how happy we are. Everything was perfect and beautiful. Thanks again Sand Petal for make our dreams come true.